There are a few major differences between turkey burgers and beef burgers. The first is obviously the type of meat. Wait… did I have to point that out? Among other things, turkey – even the dark meat – has significantly less fat than beef. This means that a burger made out of ground turkey will be less flavorful and less moist than beef burgers. It’s just a fact. Deal with it. This means – of course – that in order to make a turkey burger taste good, you need to add ingredients that put in some of that fat and flavor, or suffer through the consumption of dried-out hockey puck style burgers. This recipe has come out of a few years of experimenting with ingredients. I posted a similar recipe in the past, but as you may be aware, I like to substitute and play with the ingredients in my recipes. The burgers that this recipe yields are moist and very flavorful, but – being turkey – are easy to overcook. 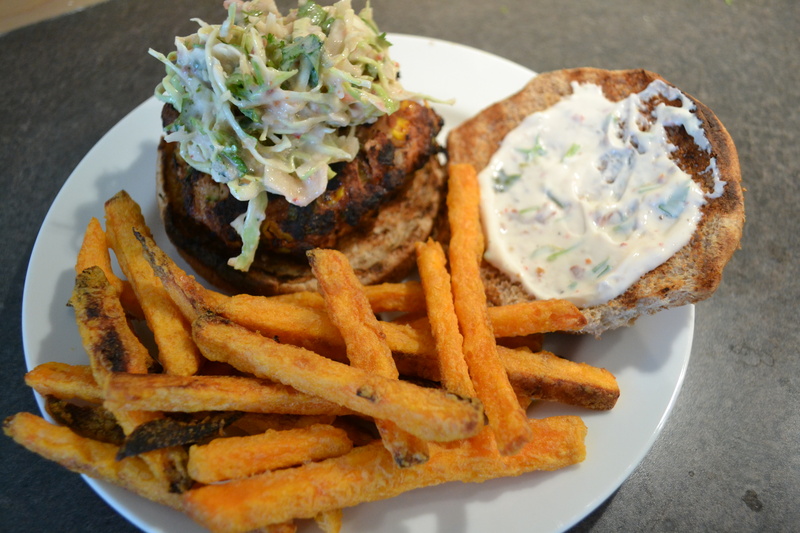 I don’t usually add cheese because I serve these burgers with a chipotle yogurt aioli. 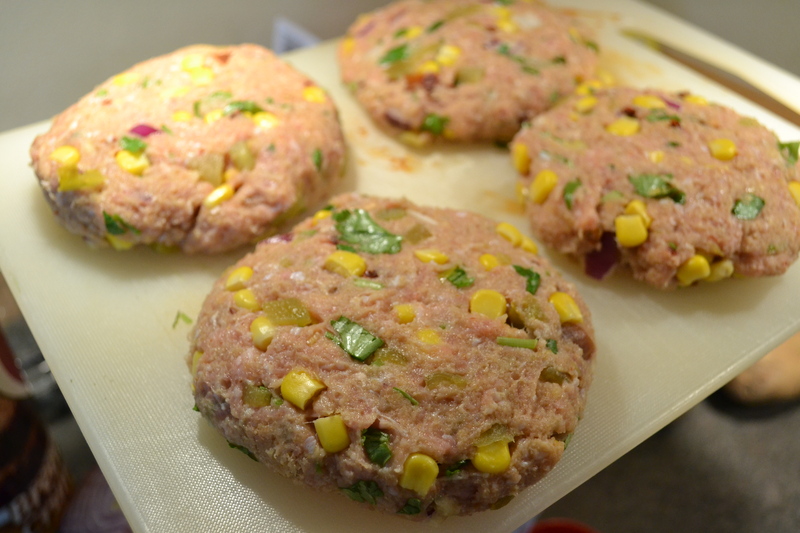 The egg and chiles add some moisture back into the meat, and bind the burgers together. Each of the minced ingredients adds a layer of flavor, and the corn lends a nice crunch to each bite. 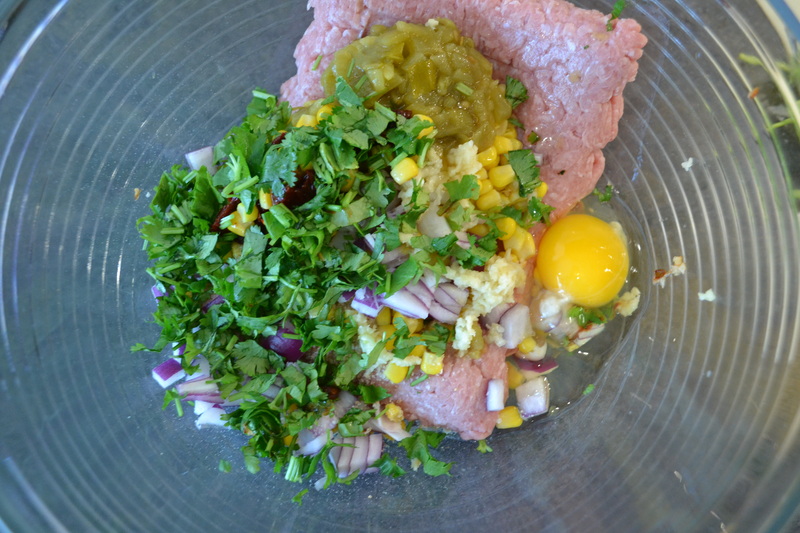 Mix the turkey, egg, bread crumbs, minced garlic, minced chipotles, green chiles, corn, red onion, cilantro and a dash of salt and pepper in a large mixing bowl. Fold the ingredients together thoroughly with your hands. Seriously, get right in there. Form the mixture into four patties (or three really big ones). Grill the patties for two minutes over medium-high heat for two minutes on each side. This short process will sear the outside of the patties, “lock in” the moisture, and give them some nice grill marks on each side. After grilling the second side for two minutes, reduce the heat to low, and grill the burgers on each side for an additional three minutes, for a total of ten minutes of grill-time. Allow the burgers to rest, and toast the buns lightly on the grill as you do. 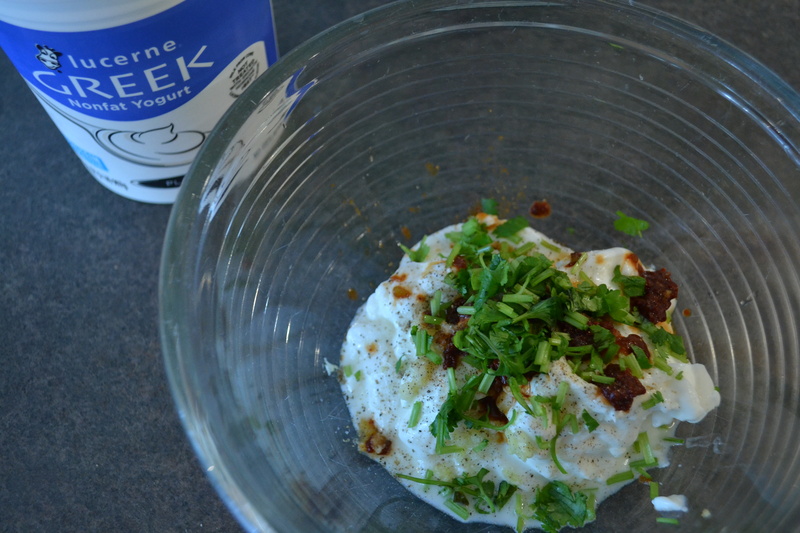 Mix up the aioli by whisking the ingredients together in a mixing bowl. Serve the burgers with a smear of aioli on the buns, some salsa-slaw and whatever other toppings and sides that you like. Coincidentally, I was just telling my husband that I want to make some feta stuffed turkey burgers tonight. Yum! Yum! I posted a wonderful stuffed turkey burger recipe a few weeks ago that would work really well with feta (I used herbed goat cheese). I love stuffed burgers! Perfect! I’ll give it a try and report back. Looking yummy! 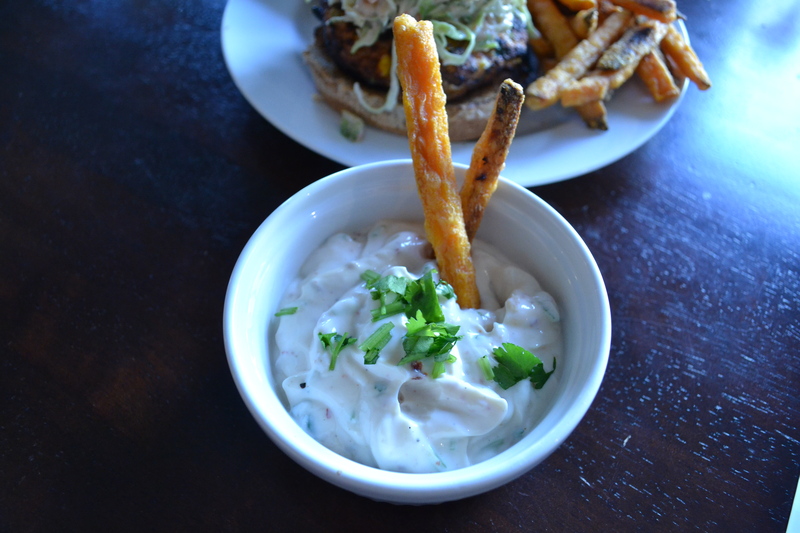 Never had sweet potato fries – do you fry them like normal ones? I usually cheat with sweet potato fries and buy them frozen from Trader Joe’s or the grocery store. That way all I have to do is bake them. Lucky you! I don’t think they sell that here in the UK. But I’ve been frying so much recently for my world cup foods challenge I might give these a try anyway! Go for it, and let me know how they turn out! Previous Entry Grilled Pizza… on Pitas?